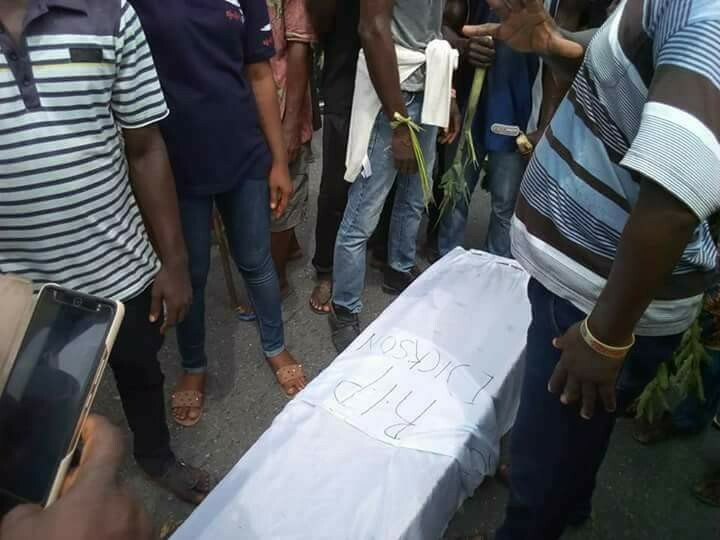 Angry protesters comprising the host community, the staff of the Niger Delta University, NDU, Amassoma, Bayelsa State, including cleaners and gardeners, locked all offices, blocked the main entrance to the institution with a coffin and some fetish items, while laying ''curses'' on Governor Henry Seriake Dickson. They were said to be protesting against the administration of Governor Henry Seriake Dickson over an alleged marginalization of the people of Amassoma, and that they want the whole world to know that the ongoing civil service reforms being carried out in the NDU by the State government is mainly targeted at the people of Amassoma Community. The protesters said the NDU will not be opened for academic activities until the State government reverses its harsh decisions concerning the workers, proclaiming the entire community, mostly the women, will not go to the bush for seven days. It is gathered that this was one of the series of protests against the maladministration of Hon. Seriake Dickson policies and decisions since inception in the State. "According to one of the protestant, this is not the first time such a protest will be held in Bayelsa State, few years ago, Bayelsa State youths, angered by Governor Seriake Dickson’s alleged “deliberate starving the State of funds”, staged a violent protest against his leadership in Yenagoa. The protest started at about 6a.m at the Tombia-Etegwe roundabout, leaving travellers stranded and bringing commercial activities to a halt. The majority of protesters were ex-militant leaders. The police said they used “the excuse of low allocation from federal government” for staging the protest. According to eyewitnesses, John Opotobo, an ex-militant from Southern Ijaw local government area was allegedly killed, while eight others sustained injuries in the course of armed confrontation with the Police. However, the Bayelsa State Police Command denied the death reports, saying they “only shot teargas canisters”, not live cartridges to disperse the crowd. They’ve also confirmed the arrest of six protesters.